Writing is not one of my favorite programs to teach. I am not a fan of diagramming sentences and I understand how hard it is to put your thoughts into words. 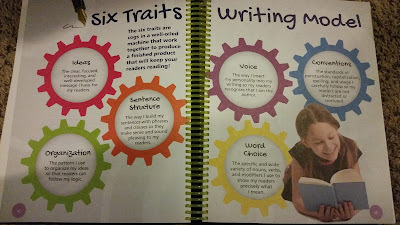 To be quite honest, our kids struggle with enough learning delays that I fighting with a strict writing program is just something that I do not want to tackle. Then I would only be making myself and the kids miserable. I was pretty excited to get a chance to review the Writers in Residence program ($89.00) from Apologia Educational Ministries. We received the Writers in Residence Volume 1 set, that includes the 576 page All-in-One student workbook and also the Answer Key. 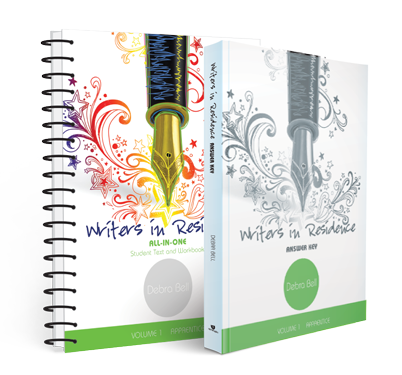 Created for Students in Grades 4 - 8, Writers in Residence has been created to incorporate both writing and language arts into one program. By using strong literature models, examples are provided for students on not only the parts of speech, but also the best examples of writing styles. Each unit is broken down into manageable modules that are meant to encourage and not overwhelm your students. A suggested daily schedule is provided at the beginning of the workbook, so that your student can work through independently or it can even help you with your lesson planning. 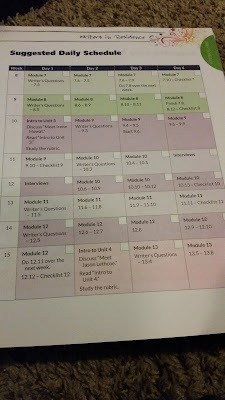 This schedule came in handy, especially when I first started using Writers In Residence. I wasn't sure how much Lydia would be able to tackle. It was nice to see in print this suggestion. You can follow it very loosely. Some sections, your student might be flying through and you might be able to accomplish more than you expect. While other lessons they may have to spend some extra time on. Throughout the program, there are interviews with Christian Writers. These were a nice encouragement, especially when reading stories about authors who didn't even enjoy writing when they were kids. 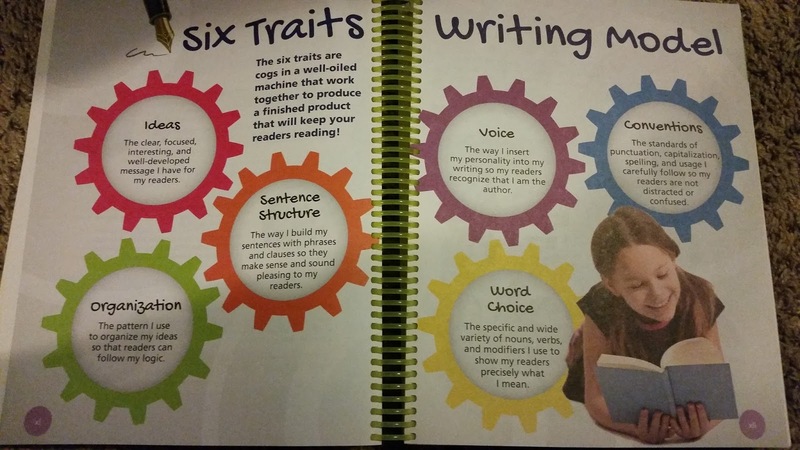 Writers in Residence uses the Six Traits of Writing model and encourages children to really look at their own writing based on these traits. I really like that this program is basically all in one large book. I do not need an extra teacher's manual to go along with it. When we are traveling this a great benefit. We did receive the Writers in Residence Volume 1 - Set that includes the separate answer key. This does allow me for an easy check for those lessons that I am not working on directly with her. Each module allows your student to look directly at their own life experiences to write about. They are just starting to live life, but can use these life events to not only write non-fiction reports but also turn them into fictional stories with fictional characters. 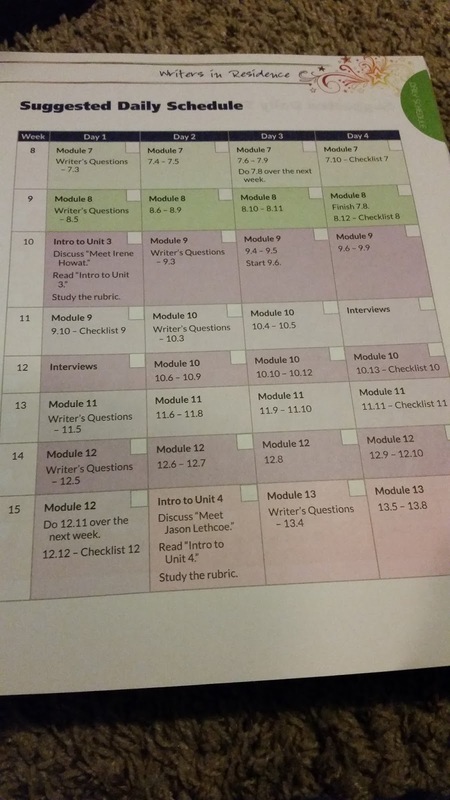 Each section also includes rubrics to help your student follow a checklist of each step they need to be completing. Each one of the short modules has enough practice to introduce a topic and give each student practice without being overwhelming. They do not need to write a huge paper with each section. Some of the topics covered are writing letters and memories, how to take notes, interview people, and even essay work. During all these various modules, language arts topics covered include adjectives, verbs, adverbs, subject/predicate work, all with the help of Roald Dahl. Yeah, there is a section on Adjectives with Roald Dahl. Who better to help teach your students?!!? Writers in Residence seemed like it might be an overwhelming program to use, but after we started using it I realized I let the size of the workbook make the judgement for me. This program has been very easy to use. Lydia has been progressing very well with her writing. I think she really appreciates the length of the lessons. She is not stuck sitting and writing for an hour. I like that you can easily use this program on a reduced weekly schedule, since not everyone does school 5 days a week. If everything continues well with Lydia, I foresee us starting Writers In Residence with Caty in another year as she grasps more reading lessons and starts writing. Writers in Residence has really been a great addition to our schoolwork to help with the dreaded writing time. So far there has been no screams of panic that it's time to do writing! That is saying a lot coming from Lydia. Several members of the Schoolhouse Review Crew were given the opportunity to review the Writers in Residence Volume 1 language arts/writing program. Take some time to visit the Schoolhouse Review Crew blog and see how they enjoyed using this program in their homes.